One of my favorite jazz albums by one of my favorite alto sax players. This one was quite hard to get my hands on. I went through some options, even bought another copy which wasn't up to scratch, before I acquired this great copy which I'm very pleased with. It is such a wonderful album that I had to find it, no matter what. One of my favorite albums that I have in my collection. I don't have that many Prestige LP's, but I'm aiming to get a lot more. There are so many great albums in their catalogue. Jackie McLean, on my top 3 alto players of all time list (the other cats being Bird and Art Pepper), recorded many great sessions for the label. This album, 4, 5 and 6 is probably one of the best. It's so good all the way through. It's made up of three different sessions, with a quartet, quintet and a sextet format therein. It contains standards mixed with originals. All the tunes are so pleasing to listen to. It's relaxing and at the same time exhilarating. There's the slow tempo first track "Sentimental Journey" in which I find some nice, loose and bluesy qualities. Not the typical harb bop tune. I like that. I often find that the bluesier jazz efforts are quite interesting and enjoyable to mix in with the standard bop format. Other stand-out tunes are the Kenny Drew original "Contour", Charlie Parker's superb, original classic "Confirmation" and the beautiful, lush take on the standard "When I Fall In Love". The last one probably being my favorite track on the album. It makes me happy and the theme really speaks to me. The line-up is stellar with Jackie McLean flanked by the great and highly talented Mal Waldron on piano, Donald Byrd on trumpet, Hank Mobley on tenor, Doug Watkins, who plays a terrific double bass solo on "Sentimental Journey" and the always amazing Art Taylor handles the drums in such a tasteful way. All in all, this LP is an absolute must in any jazz collection. I've waited a long time to be able to add this original 1st pressing to the collection. And it's been worth the wait. It's not an easy one to find in great condition. There are a lot of Prestige LP's on my want list. I will maybe go for another one before long. 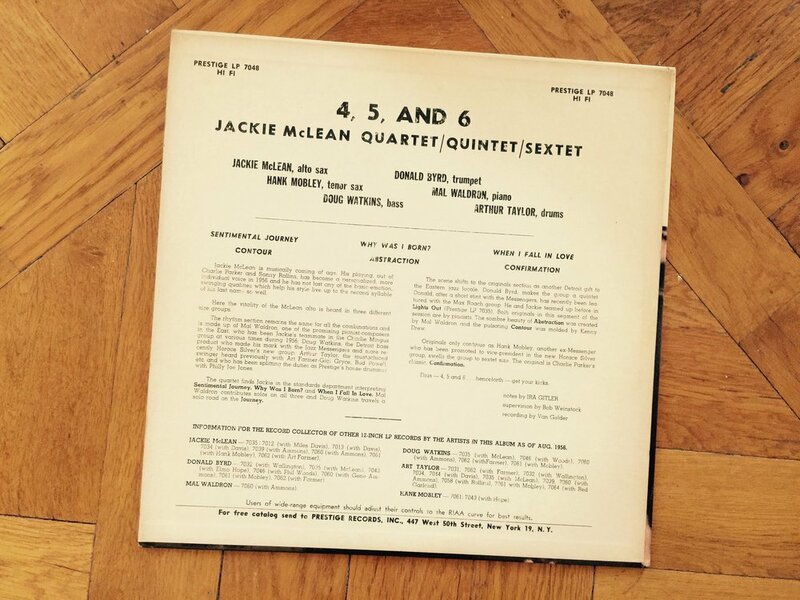 The Jackie McLean and Bill Hardman album on PRLP 7068 is very tempting for example. Let's see what happens. Regarding the new additions department: I have just added two great LP's to the collection. One of them is an awesome and very rare album which I have been looking for for a long time. And the thing also with this particular copy is that it was owned by one of the cats playing on the record. The vinyl is red... can you guess which one it is? Stay tuned for more great vintage original jazz LP treats. Have a nice weekend, and please leave a comment if you want. Maybe you own the PRLP 7048 yourself and would like to share your thoughts on it? Cheers!